Crime was dealt with much more severely in 1812 than today. Indeed, life was harsher and more physically demanding than it is today. Corporal punishment was often inflicted as a deterrent to crime. As in society where commoners were punished more harshly than the gentry for a given crime, so too were soldiers of the British army reprimanded in a physical way for an offence for which an officer would simply receive a fine. For a particularly onerous crime, the soldier could be shot or lashed to death; the officer would be banished from the army. 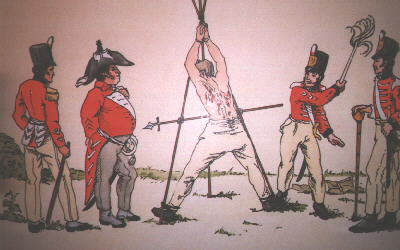 Four of twelve mutineers arrested in the summer of 1803 at Fort George were executed in early March, 1804, in Quebec City. A Court Martial sentenced three others to transportation as felons and acquitted five. The year before, these mutineers had planned to assassinate the commander of the fort, Lieutenant Colonel Roger Sheaffe. Colonel Isaac Brock of the 49th Regiment came from York to apprehend the guilty men. He was personally moved by this tradedy because he knew the men: they had been soldiers in his regiment, fighting against Napoleon on the battlefields of the Continent. 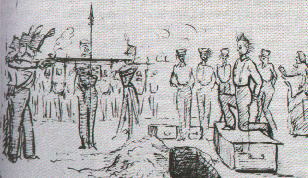 CLICK HERE to read about "The Ancaster Bloody Assize of 1814"
This drawing of a military execution shows the condemned man with his hands tied behind his back kneeling over his grave. The rest of the men were made to stand and watch, this would serve as a deterrent for others. When shot the man would fall into his grave, supposedly.